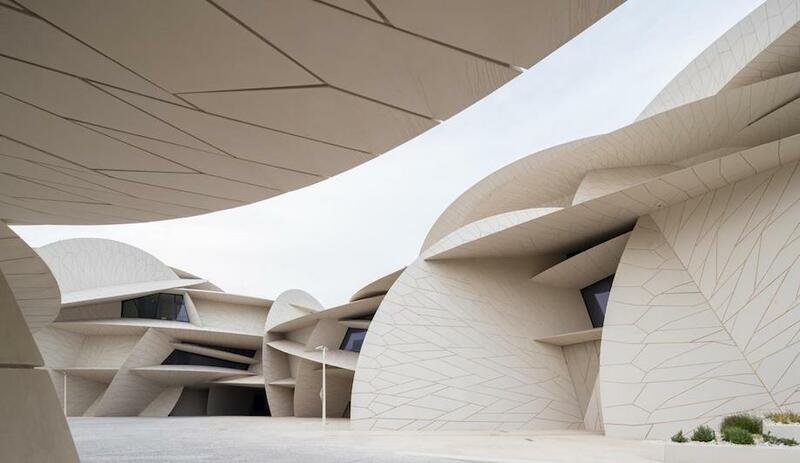 Building with mud and bamboo, making more with less money, cradle-to-cradle principles, eco-engineering, shelter for migrants – the 15th International Architecture Exhibition is no starchitect’s biennale. 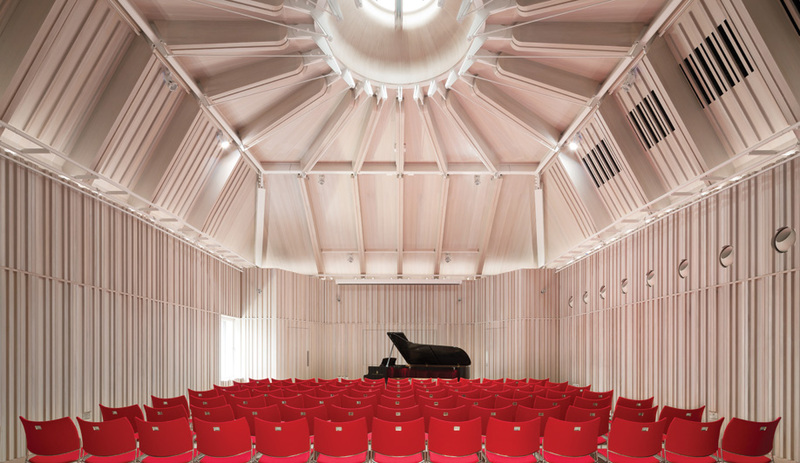 Among the criteria the curatorial team used to select the projects and practices was their ability to create positive outcomes under difficult conditions; another was that the architects consistently produce good work – timeless, yet responsive to the challenges of our time. 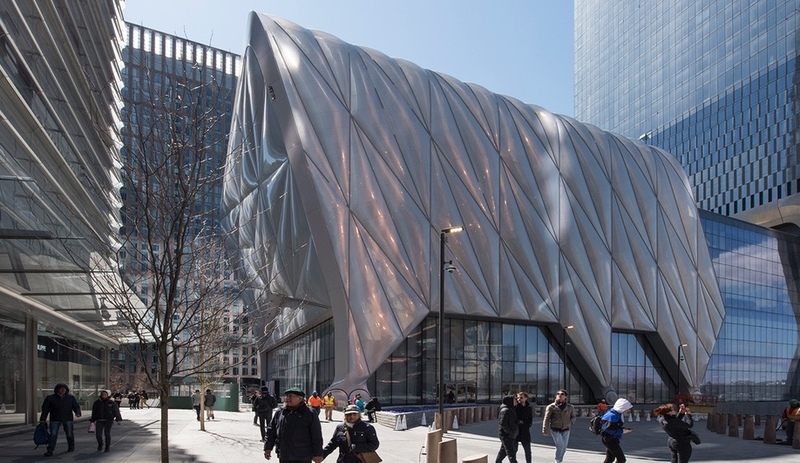 The result is stories from the trenches that often exalt architecture’s humanistic side, at a time when we are more accustomed to displays of its visual and marketing values. Reporting from the Front is wide-ranging and meaningful, much like the architecture of Alejandro Aravena himself. 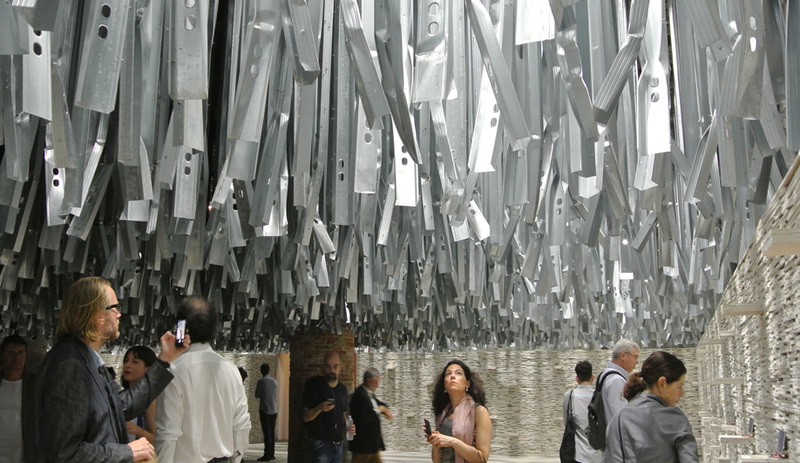 The striking decor at both the entrance to the Arsenale – the enormous former shipbuilding facility that houses the main part of the exhibition – as well as at the entrance to the Central Pavilion – where the rest of the curator’s show can be found – was made out of construction debris from the art biennale that closed last November. Twisted metal studs were suspended from the ceiling and the walls were formed of stacks of discarded drywall. 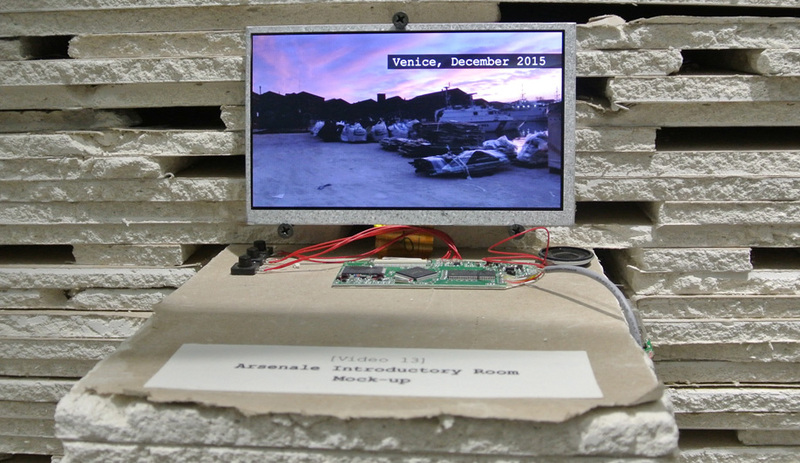 Ingenuity trumped budget more than once in this biennale, underlining a persistent focus on the value of conserving resources, including those of the financial variety. 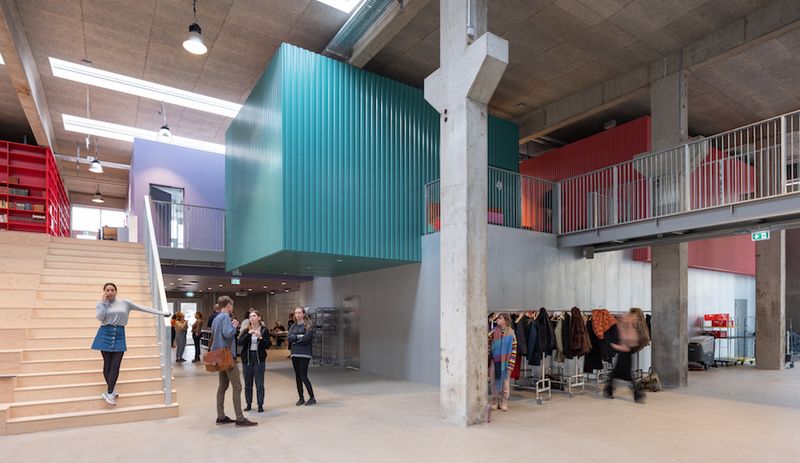 The Neubau project by BeL Sozietät für Architektur, contemplates the integration of 12 million migrants into a German urban reality. 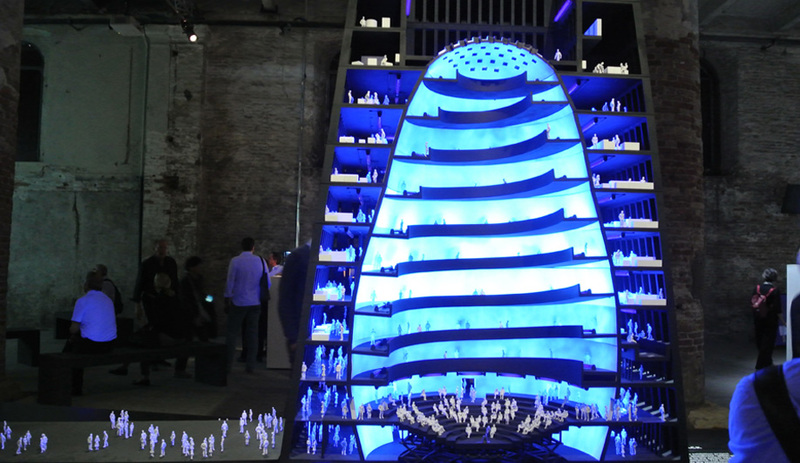 Within the blue Styrofoam model are examples of how self-built techniques can be incorporated into a multi-storied platform. 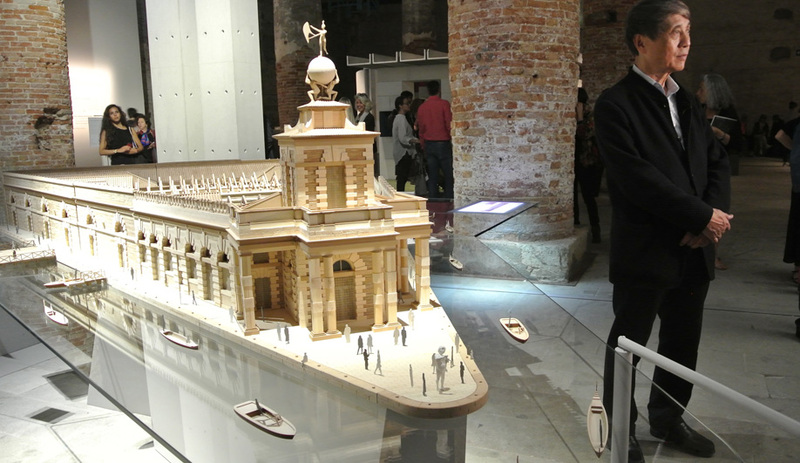 A model of Boris Bernaskoni’s Matrex building appears in the Arsenale as an example of a project that has maintained its integrity from concept to realization. The main public building in the Russian city of Skolkovo, it contains startup offices, an event hall, a spiraling museum and a restaurant, all within the suggestive form of a Matryoshka. Bucharest, Romania’s ADNBA has provided the intriguing Hilariopolis – a block full of peep-holes into bourgeois scenarios meant to represent standard residential developments. ADNBA brings to our attention that, for developers, architecture is often just a way to make money. 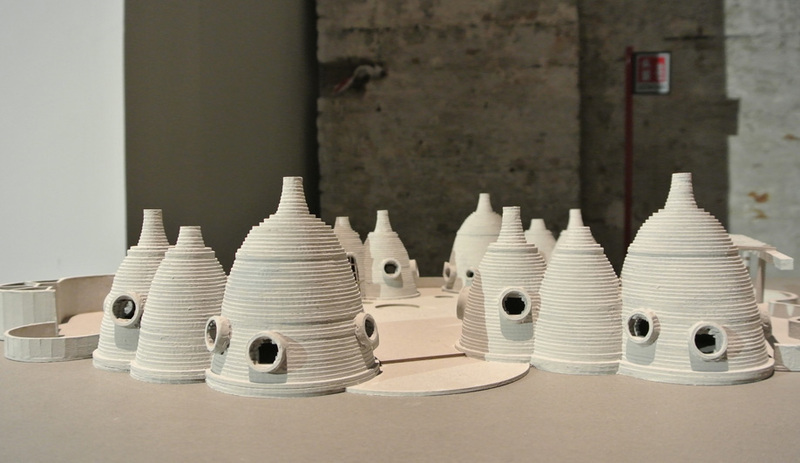 A model of Volontariat Homes for Homeless Children, by Anupama Kundoo Architects, serves as an example of architecture that is rooted in place and based on a profound understanding of local materials and culture. These houses for 15 children and five foster parents in Pondicherry, India were constructed of mud. 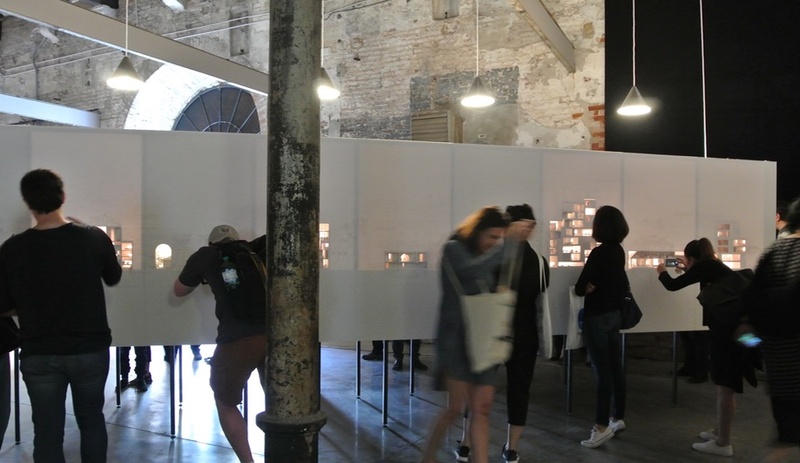 Climate engineering firm Transsolar is celebrated in the Arsenale with an exhibit that is more evocative than demonstrative. 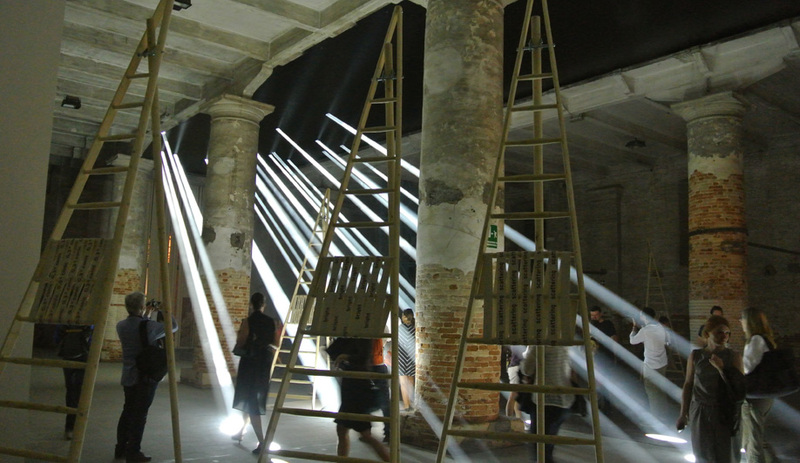 Cones of light and tall ladders make theatre of Transsolar’s important contributions toward channeling the forces of nature, rather than opposing them. 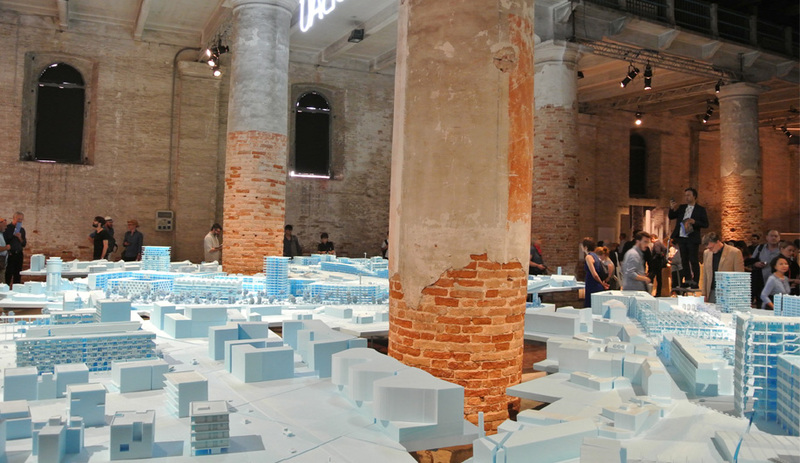 Tadao Ando made an appearance in the Arsenale alongside an intricate model of his Punta della Dogana Contemporary Art Center, completed in Venice in 2009. Ando’s project becomes a prism for examining architecture called to negotiate between heritage, change and economic forces. 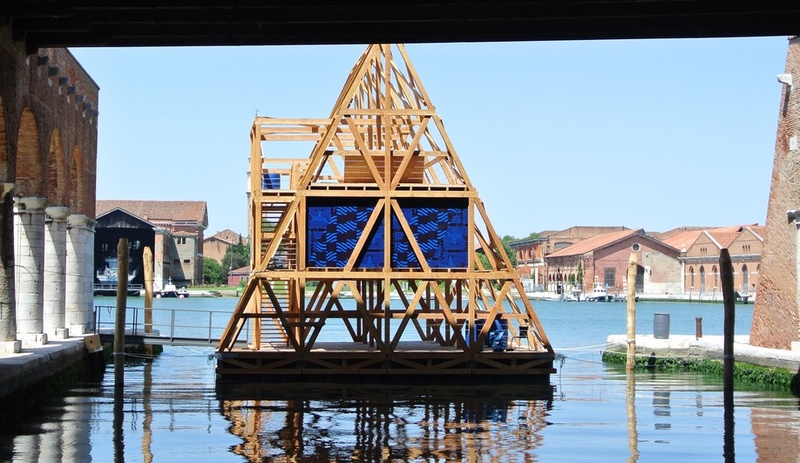 Nigerian architect Kunlé Adeyemi’s floating school, built for the water community of Makoko, a slum in Lagos, Nigeria, was reconstructed in the canal outside the Arsenale. 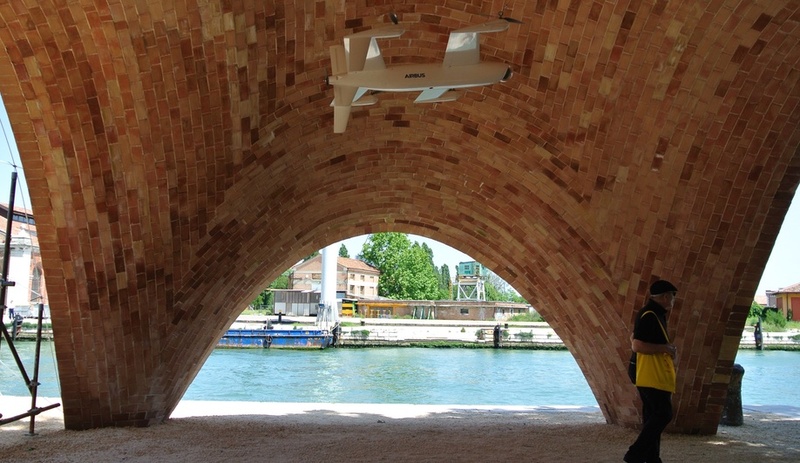 The Norman Foster Foundation contributed Droneport to the grounds of the Arsenale. The basic idea is that drones may come to be used to transport small goods in Africa and a flexible, modular port architecture, made of compressed clay bricks, could supply the necessary infrastructure. 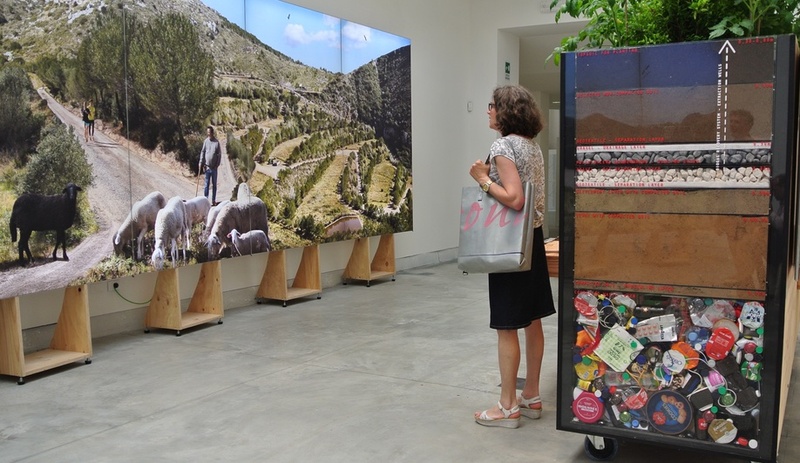 Batlle I Roig architects demonstrate that landfill can once again become landscape. Vall D’en Joan Waste Landfill site in Spain, a destination for Barcelona’s urban waste since the mid-70s, was successfully integrated into Garraf Natural Park using strategies derived from farming techniques.